1 glass of white wine, about 4 to 6 ounces. Put in the fridge. Get that oven rockin' at 375°F. In a bowl, mix plain bread crumbs, chopped parsley, 1 teaspoon of olive oil, salt and pepper, and set aside for later. Place filets with the skinside down in a lightly oiled baking pan (could be a non-stick pan, if you prefer). Spread an even layer of the bread crumb mixture over the fish and let cook about 20 minutes, maybe 30, until fish is cooked through thoroughly. While the fish is cooking, take the wine out of the fridge and drink it. You deserve it, so give yourself a break. After you inebriate yourself a little, boil 1-1/4 cups of water pot. This should come to a rolling boil. Pour in the Realemon juice and the rest of the olive oil (1 teaspoon). Slowly stir in the couscous, replace the cover, turn the flame down low, and let it stew for about 2 or 3 minutes. Take the pan off the heat and let stand, with the cover on, for approximately 5 to 7 minutes. Add the dill, lemon zest. Salt and pepper to taste. If you do it right, you will have all the food done at the same time AND a little buzz to boot! Plate the trout and serve the couscous as a side dish. Cook's note: You will need two baking pans for this one to avoid the crowding of the fishies. Cook bacon approximately 5 to 10 minutes or until getting brown and crispy. Use a slotted spoon to move the cooked bacon to a paper towel and let drain. Save about a quarter of the bacon fat. If the bacon doesn't make enough of it's own fat, add a touch of olive oil and thank me for telling you to keep the bottle handy. Put the onion in the hot skillet and cook until softened and the edges start to brown up. Add the bacon, the raisins, red wine vinegar, cane sugar, and 1/4 tsp of salt. Boil this to reduce to about 1/3 cup of liquid. Take off of the flame, but keep warm for later use. Make sure the broiler is heated up and the pans are oiled well, cuz here we go! In each pan, place 2 golden trout (4 filets), butterflied open with the skin side facing down. Brush each filet with olive oil (total of 2 tsp) and sprinkle with ground peppercorns (you can find a peppermill at the local grocery store) and the rest of the table salt. Broil fish, one pan at a time, at around 4" from flame, just until cooked thoroughly; maybe 3 to 5 minutes, and cover loosely with aluminum foil. Keep warm while you broil the second pan of fish. Divide the bacon mix between the 4 fish and spoon it on down the center of each fish. The rest of the juices in the skillet can be drizzled over the fish to make it delish! 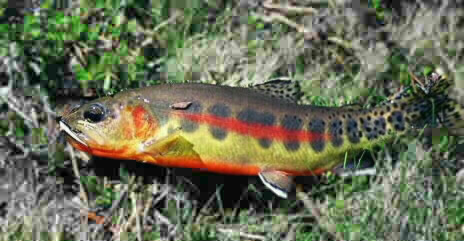 Thank you for trying our golden Trout recipes. 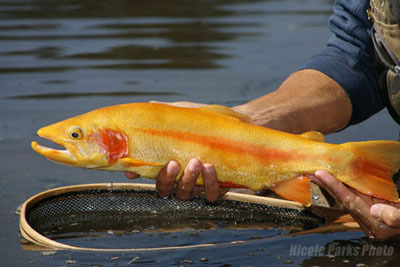 If you have other Golden Trout recipes to share with the world, please let us know.